The Scorchers are all but mathematically out of the tournament now after their disappointing loss to Sydney Thunder last time out although they will be keen to salvage some pride especially in front of their home fans. They made the move to drop struggling veteran Michael Klinger for that last game and it paid off as they hit 181 which is their highest total of the tournament so far, and he will likely miss out again here even if he returns for the final home match next weekend against the Stars in what could be a farewell appearance. After making an unbeaten 15 from 11 balls, talented young batsman Nick Hobson should retain his place and they may decide to give another youngster an opportunity to gain some experience as they consider their approach for season’s Big Bash. The Renegades are coming off a 12-run win over Sydney Thunder and with the race for the top four places so tight at the moment, they know they have to win here to maintain their spot in the play-off places. The biggest positive from the win over the Thunder was the return to form of veteran Cam White who had been struggling prior to his 40 from 29 balls, and they will hope he and Finch can reproduce their form from that game and kick on further. Joe Mennie returns to the squad at the expense of Jon Holland but the likelihood is that they name an unchanged line-up for this crunch match although they will still be wanting more from all-rounders Nabi and Christian who are not contributing enough right now. 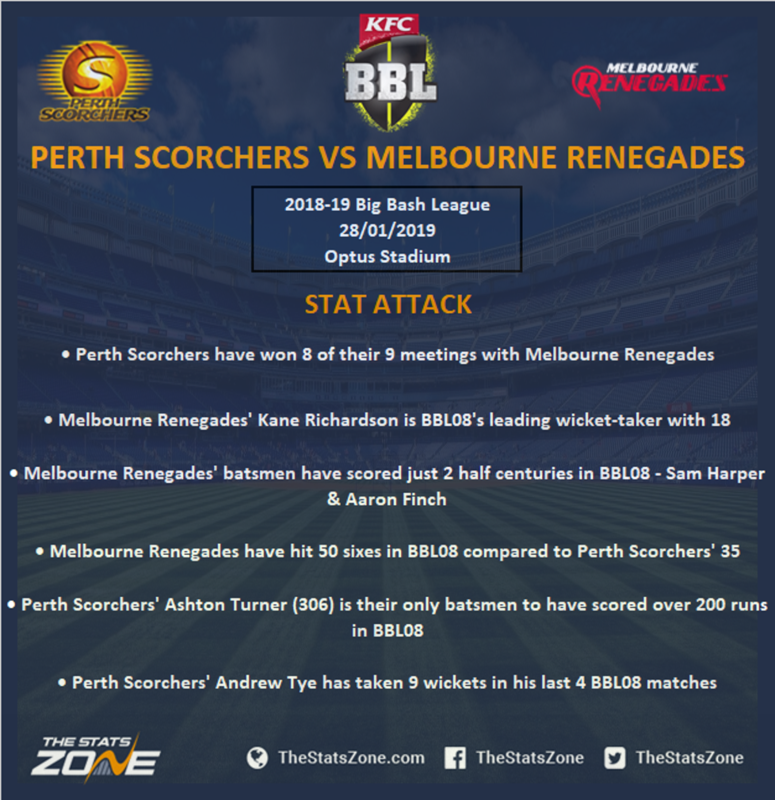 The Scorchers’ season is petering to something of a miserable end which is not a situation they are accustomed to in the Big Bash. They have virtually no chance now and all the talk coming out of Perth suggests they are resigned to that fact after the loss to Sydney Thunder last time out. The Renegades on the other hand are desperate for a win to stay in the hunt for a knockout spot and they have form on their side too. With Finch and White finding some form now, they should have too much firepower for the Scorchers to live with here.